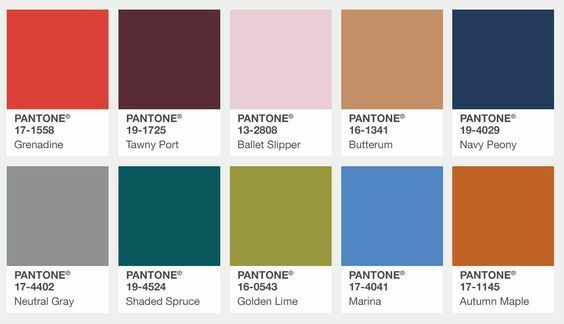 I used a variety of teals, blues, and greens to create Bluebird Singing in the Dead of Night. 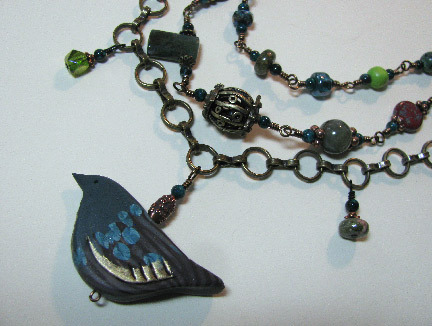 My inspiration for this piece was the cute little polymer clay bird made by my friend Heather Powers of Humble Beads. 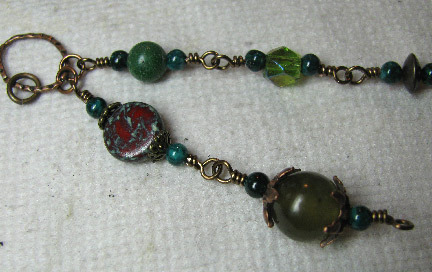 If you'd like to own the original necklace shown above, he is for sale here. Each of the accent beads is surrounded by two small dyed stone beads that perfectly match the popular Shaded Spruce color that is everywhere this fall. This ties all the bead links together. 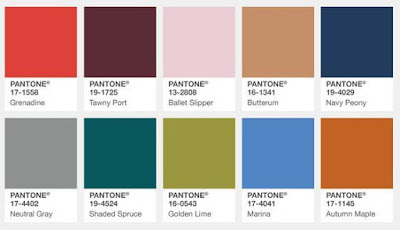 I feel good about using this palette, because I know that these colors tend to be perennially popular and won't look dated after just one season. 1. 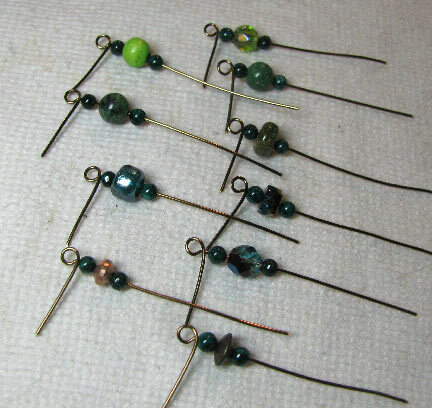 Choose beads for the top (shortest and smallest) strand. Cut wires for each link and begin the wrapped loop turn on one end. All the strands will look best if you pick an odd number of beads. 2. Decide on the arrangement and link them together between two hammered oval links. Use a jump ring at each end. 3. Do the same for the middle (medium size and length) strand. 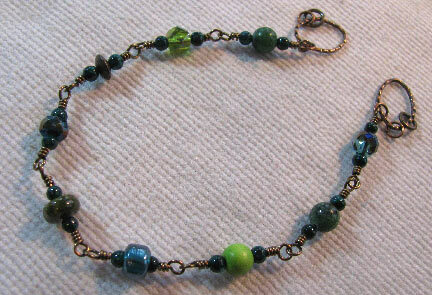 Choose either slightly larger beads or, if you want to keep them the same size as step 1, add a few more of them. 4. Add a length of chain for the bottom (longest) strand. 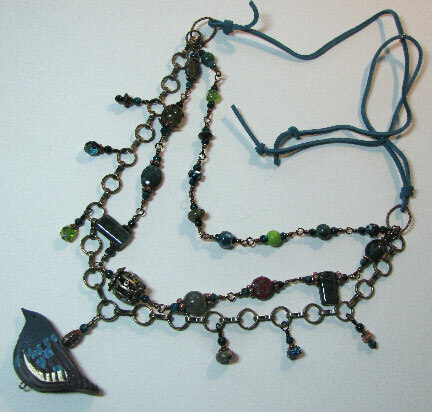 Make sure your chain has an odd number of links so you can add your focal to the middle link. 5. 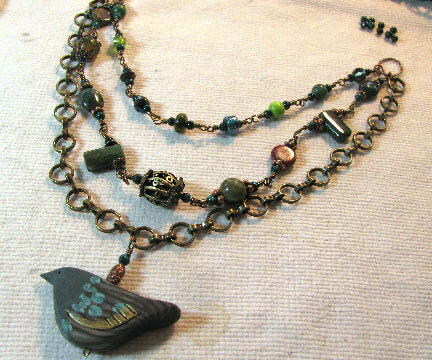 Add a few dangling links to each side of the bird. Cut some leather cording (or similar non-animal material if you prefer and tie it to each oval link. I've used a small soldered ring to keep the cords together near the top. Make the cords long so you can adjust the length depending upon what you're wearing.